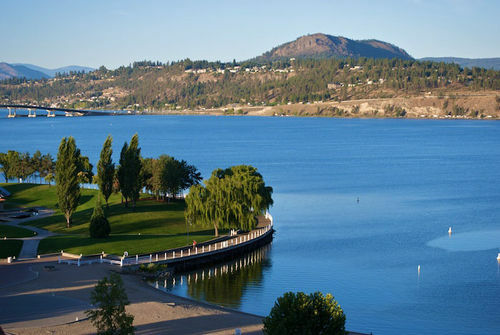 Kelowna is a recreational paradise. 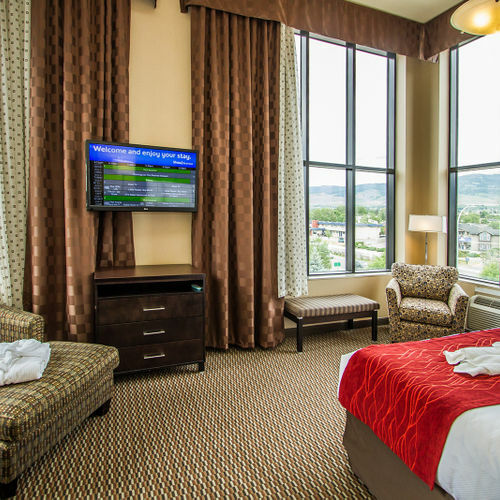 Whether you’re here to experience the natural beauty of the Okanagan Valley, or you’re after shopping, dining and other big-city amenities, the Comfort Suites Kelowna places it all at your fingertips. 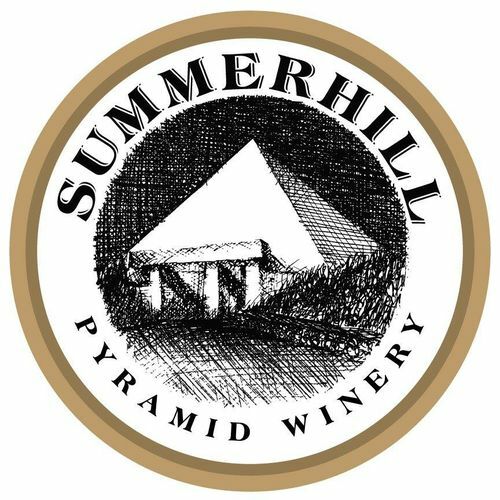 We’re located just minutes from the city’s thriving downtown area, as well as stunning beaches, wineries, orchards, mountains, golf courses and countless other outdoor attractions. 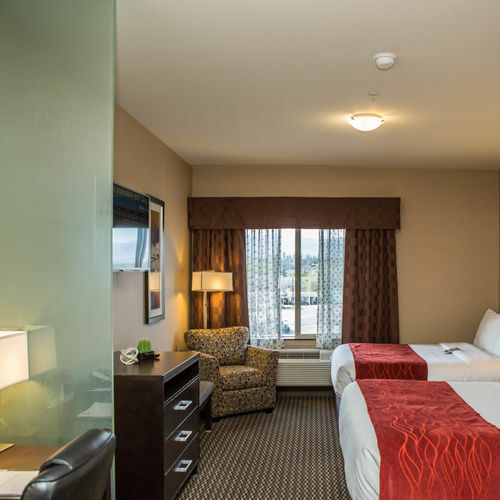 We’re also one of the top hotels in Kelowna near the airport, making us the destination of choice for business travellers. 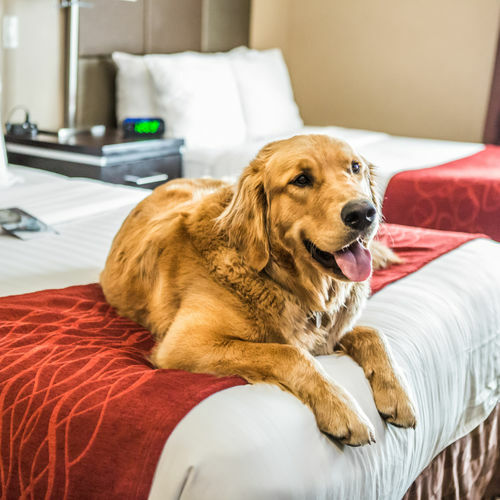 As one of the newest all-suite hotels in Kelowna, our modern facilities boast 83 luxuriously appointed suites in 11 distinctive room types, allowing guests to book a stay that meets their travel style and budget. 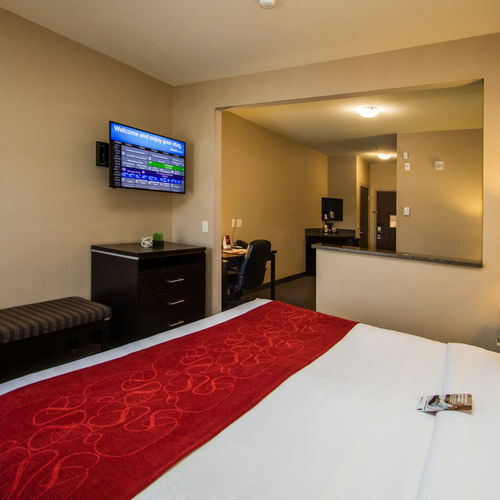 During your stay, we encourage you to take advantage of our hotel’s many services and amenities. 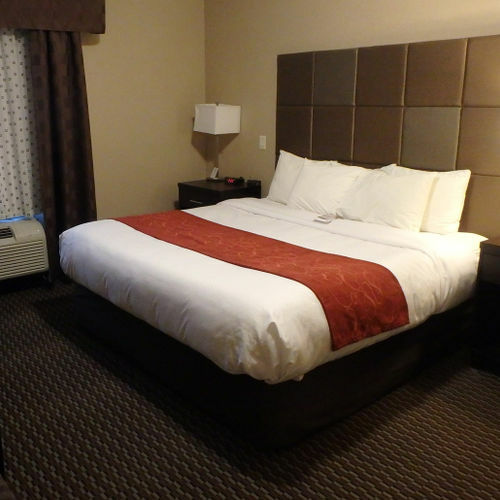 We offer a complimentary hot breakfast buffet, indoor swimming pool with waterslide and hot tub, 24-hour fitness centre and business meeting rooms. 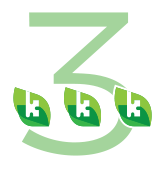 Should you require assistance at any time during your stay, our friendly, attentive customer service team will be happy to help. 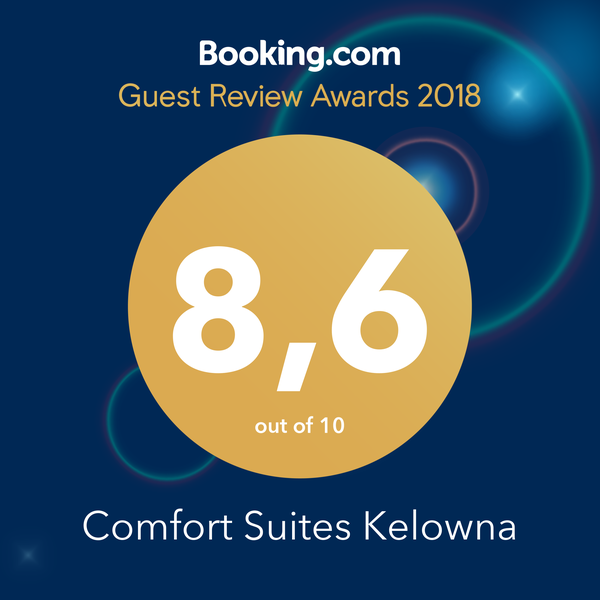 If you’re looking for affordable accommodation in Kelowna without sacrificing comfort or quality, look no further than the Comfort Suites. 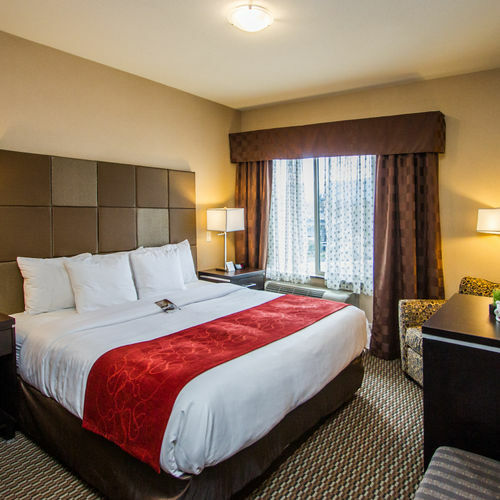 Whether you need a set of budget-friendly Two-Queen Suites to house your kids’ hockey team, or you’re treating a special someone to a romantic weekend getaway in our Executive Jacuzzi Suite, we have have a selection of 11 suites to meet your travel needs. 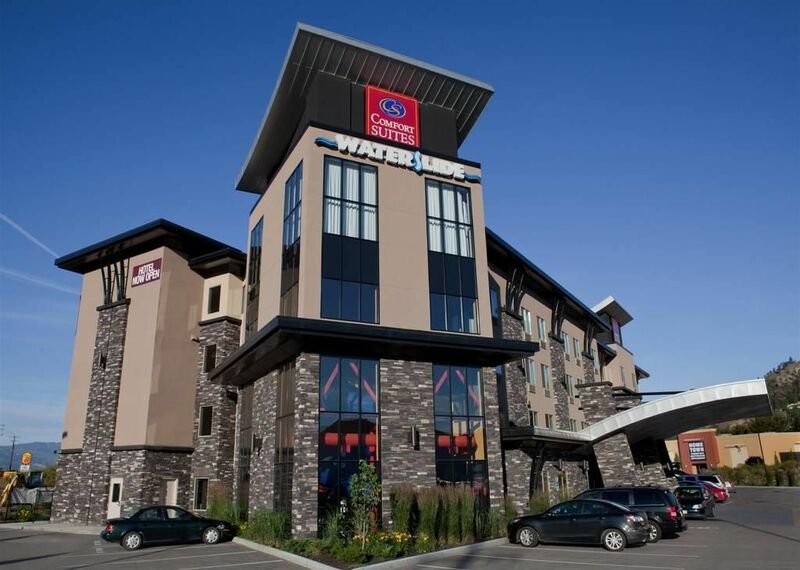 The Comfort Suites is also one of the best hotels in Kelowna for added conveniences. Our Wheelchair Accessible Queen Suites are specially designed with wider doorways, wheel-in showers, lower light switches and hearing-impaired doorbells. For a more luxurious travel experience, be sure to ask about our Deluxe Family, Superior Family and Honeymoon Suites. 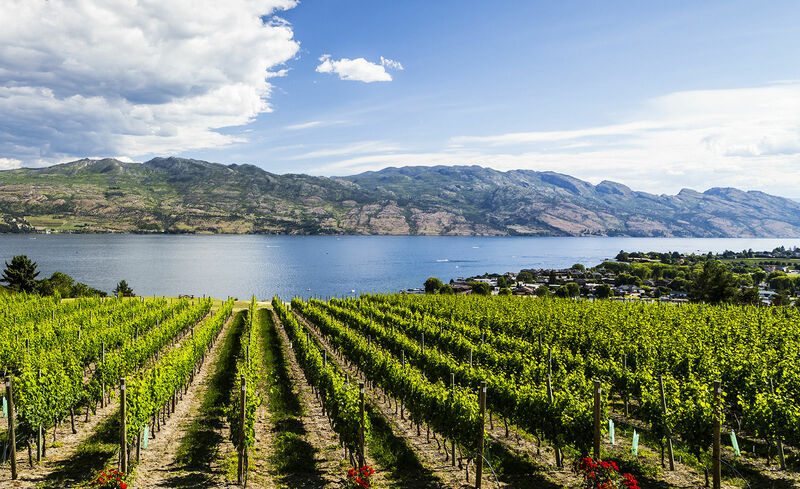 Heralded as ‘The Napa of the North’ by travel writers, Kelowna has become a popular destination for travellers from across BC, Canada and around the world. 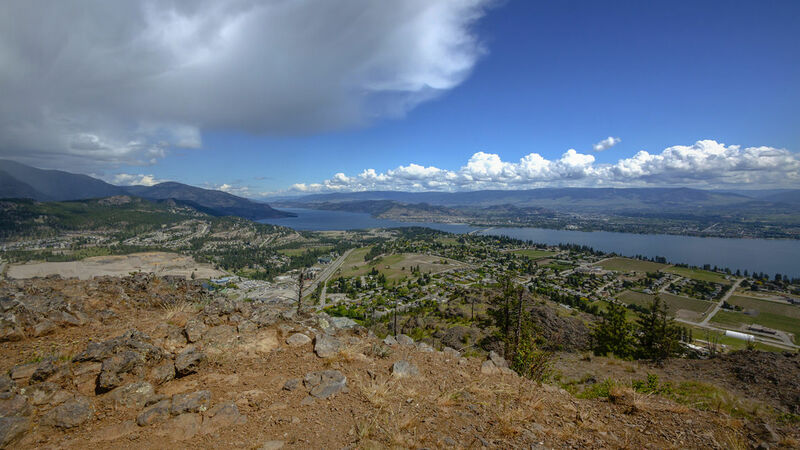 Whether you’re ready to explore the wine trails, the fairways, the vast Okanagan Lake, or the dining, shopping and shows that makes this Interior community eclectic, you’re sure to spend your days thinking, ‘I can’t wait to come back again. With fabulous hot summers and an incredibly expansive lake at almost every turn! The beach has become a way of life in Kelowna. You can rent a boat, take a tour or simply bask on the shores just footsteps from some of the city’s best eateries. 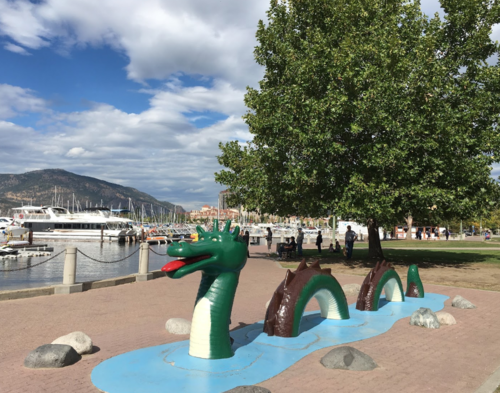 After you have experienced a day on the Okanagan Lake, you can enjoy another round of water fun at our Kelowna hotel with a waterslide. 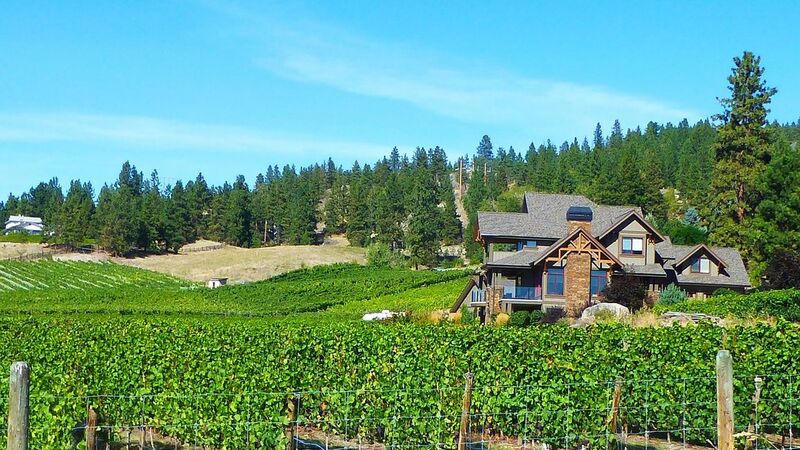 Learn how to tell the difference between a Gewürtztraminer and a Riesling on Okanagan wine tours as you explore the valley’s world-renowned and hidden gem wineries—dozens of which are just a short drive from our front lobby. 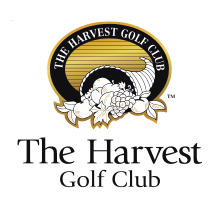 Equally close and impressive are Okanagan golf courses, several of which are champion designed and boast landscapes dotted with fruit trees and lake views. For everything else, there’s the vibrant downtown Kelowna and highway strip. 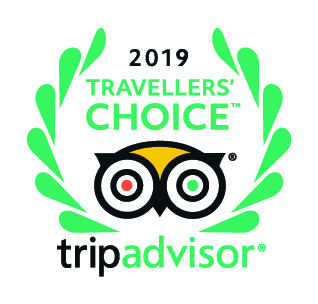 Here you’ll find award-winning restaurants featuring local fare, artisans, cafés, theatres and Prospera Place, which is home to the Kelowna Rockets WHL team and an outstanding line-up of concerts and events throughout the year. 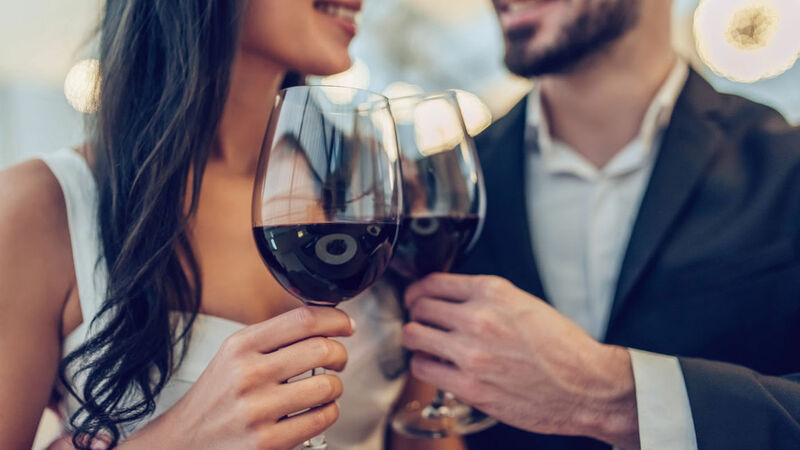 Sip and eat to your heart’s content at the Taste Lake Country event, part of Okanagan wine tours along Lake Country’s Scenic Sip. Pack your hiking boots! 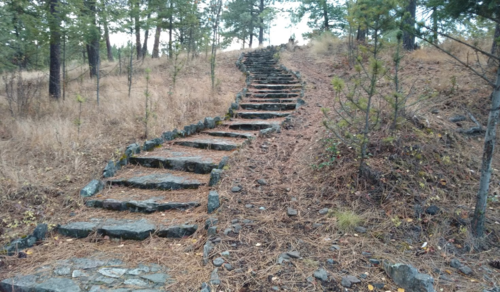 We look at some of the best places to explore nature and see the sights from our Kelowna accommodations. 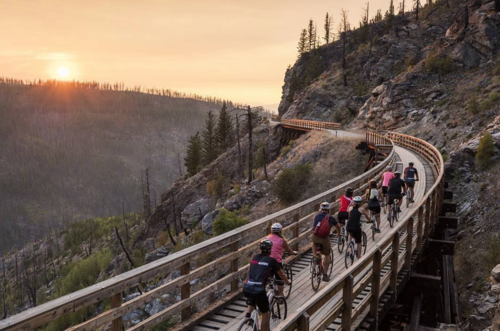 See the Okanagan by foot or bike or let someone else do the driving when you stay at the Comfort Suites hotel in Kelowna. 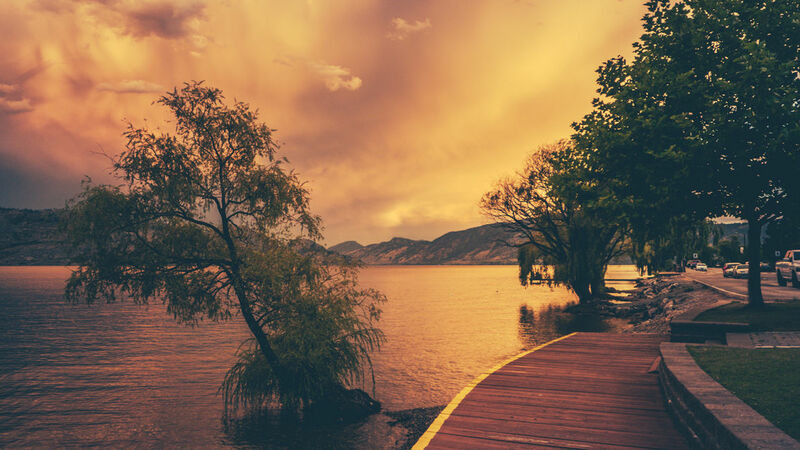 Bank on these five date ideas that your other half will love when staying at our hotel in Kelowna.